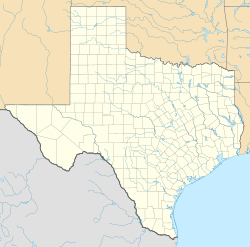 Denton is a city in and the county seat of Denton County, Texas, United States. As of the 2010 United States Census, its population was 113,383, making it the 27th-most populous city in Texas, the 200th-most populous city in the United States, and the 12th-most populous city in the Dallas–Fort Worth metroplex. A Texas land grant led to the formation of Denton County in 1846, and the city was incorporated in 1866. Both were named after pioneer and Texas militia captain John B. Denton. The arrival of a railroad line in the city in 1881 spurred population, and the establishment of the University of North Texas in 1890 and Texas Woman's University in 1901 distinguished the city from neighboring regions. After the construction of Dallas/Fort Worth International Airport finished in 1974, the city had more rapid growth; as of 2011, Denton was the seventh-fastest growing city with a population over 100,000 in the country. Located on the far north end of the Dallas–Fort Worth metroplex in North Texas on Interstate 35, Denton is known for its active music life; the North Texas State Fair and Rodeo, Denton Arts and Jazz Festival, and 35 Denton Music Festival attract over 300,000 people to the city each year. The city experiences hot, humid summers and relatively few extreme weather events. Its diverse citizenry is represented by a nonpartisan city council, and numerous county and state departments have offices in the city. With over 45,000 students enrolled at the two universities located within its city limits, Denton is often characterized as a college town. As a result of the universities' growth, educational services play a large role in the city's economy. Residents are served by the Denton County Transportation Authority, which provides commuter rail and bus service to the area. Denton incorporated in 1866; its first mayor was J.B. Sawyer. As the city expanded beyond its original boundaries (which extended half of a mile in every direction from center of the public square), it became an agricultural trade center for the mill and cottage industries. The arrival of the Texas and Pacific Railway in 1881 gave Denton its first rail connection and brought an influx of people to the area. North Texas Normal College, now the University of North Texas, was established in 1890, and the Girls' Industrial College, now Texas Woman's University, was founded in 1903. As the universities increased in size, their impact on Denton's economy and culture increased. Denton grew from a population of 26,844 in 1960 to 48,063 in 1980. Its connection to the Dallas-Fort Worth metroplex via I-35E and I-35W played a major role in the growth, and the opening of Dallas/Fort Worth International Airport in 1974 led to an increase in population. In the 1980s, heavy manufacturing companies like Victor Equipment Company and Peterbilt joined older manufacturing firms such as Moore Business Forms and Morrison Milling Company in Denton. The population jumped from 66,270 in 1990 to 80,537 in 2000. In May 2006, Houston-based real estate company United Equities purchased the 100-block of Fry Street and announced that several of the historic buildings would be demolished to accommodate a new mixed-use commercial center. The proposal drew opposition from some residents, who sought to preserve the area as a historic and cultural icon for the city. The Denton City Council approved a new proposal for the area from Dinerstein Cos in 2010. 1869 - J.B. Sawyer became mayor. 1954 - Federal Civil Defense Administration regional office relocated to Denton from Dallas. Denton is located on the northern edge of the Dallas–Fort Worth metropolitan area. These three cities form the area known as the "Golden Triangle of North Texas." According to the United States Census Bureau, the city has a total area of 89.316 square miles (231.33 km2), of which 87.952 square miles (227.79 km2) is land and 1.364 square miles (3.53 km2) is covered by water. The city lies in the northeast edge of the Bend Arch–Fort Worth Basin, which is characterized by flat terrain. Elevation ranges from 500 to 900 feet (150 to 270 m). Part of the city is located atop the Barnett Shale, a geological formation believed to contain large quantities of natural gas. Lewisville Lake, a man-made reservoir, is located 15 miles (24 km) south of the city. With its hot, humid summers and cool winters, Denton's climate is characterized as humid subtropical and is within USDA hardiness zone 8a. The city's all-time high temperature is 113 °F (45 °C), recorded in 1954. Dry winds affect the area in the summer and can bring temperatures of over 100 °F (38 °C), although the average summer temperature highs range from 91 to 96 °F (33 to 36 °C) between June and August. The all-time recorded low is −3 °F (−19 °C), and the coolest month is January, with daily low temperatures averaging 33 °F (1 °C). Denton lies on the southern end of what is commonly referred to as "Tornado Alley"; the National Weather Service occasionally issues tornado watches, although tornadoes rarely form in the city. The city receives about 37.7 inches (96 cm) of rain per year. Flash floods and severe thunderstorms are frequent occurrences during spring. Average snowfall in Denton is similar to the Dallas–Fort Worth average of 2.4 inches (6.1 cm) per year. Denton is home to several annual artistic and cultural events that cater to residents and tourists. The annual North Texas State Fair and Rodeo began in 1928 and promotes the cowboy culture of Texas. In addition to a rodeo, the event features several local country rock performances, pageants, and food contests. Hosted by the North Texas State Fairgrounds since 1948, the fair brings in over 150,000 people during its nine-day run. The Denton Municipal Airport has hosted the annual Denton Airshow since 1998. The event includes aerial demonstrations and airplane exhibits; it attracted over 10,000 attendees in 2012. Other events in the city include an annual Redbud Festival, the Fiesta on the Square, and the Thin Line Documentary Film Fest. Denton houses the largest community garden in the United States, specifically Shiloh Field Community Garden, which measures at 14.5 acres of land. The local independent music scene in Denton has emerged alongside Denton's academic music establishments, including the University of North Texas College of Music. The city's live music venues are largely supported by Denton's college-town atmosphere, although show attendance is bolstered by area residents. The Dallas Observer features a column on Denton's local music scene. In 2007 and 2008, Denton's music scene received feature attention from The Guardian, Pop Matters, and The New York Times. Paste Magazine named Denton's music scene the best in the United States in 2008. The city-sponsored Denton Arts and Jazz Festival attracts over 200,000 people each year for live music, food, crafts, and recreation at Civic Center Park. Bands such as Tower of Power, Brave Combo, and Arturo Sandoval have performed at the festival, as well as jazz groups from the University of North Texas. With hopes of creating a live music event similar to South by Southwest, Denton held the first annual North by 35 Music Festival, now called 35 Denton, in March 2009. In 2014, the Huffington Post listed Denton as the number-one emerging cultural hot spot in Texas to visit, while referring to Denton as "Practically an indie band factory at this point..."
The Denton Square, bordered by Oak, Hickory, Locust, and Elm Streets, is a cultural and political hub of the city. At its center is the Denton County Courthouse-on-the-Square, which includes local government offices and a museum showcasing area history and culture. Listed on the U.S. National Register of Historic Places, the former county courthouse was restored for the Texas Sesquicentennial in 1986. The positive response to the renovation sparked a downtown revitalization program that generated new jobs and reinvestment capital. The downtown square is populated by local shops and restaurants, some of which have been in business since the 1940s. Each year, the downtown square is adorned with lights and spotlighted during the Denton Holiday Lighting Festival. The Confederate Soldier Monument, a 12-foot tall (3.7 m) granite monument consisting of an arch topped by a statue of a Confederate soldier, was erected in 1918 in Denton Square on the courthouse lawn by the Daughters of the Confederacy. The monument is controversial, and attempts to have it removed have been unsuccessful. Denton is the county seat of Denton County. From 1914 to 1959, the City of Denton used a mayor–city commission system, but a charter adopted in 1959 created a council–manager form of city government. Residents elect a mayor, four single-member district council members, and two at-large members. The city manager is appointed by the Denton City Council. Council terms are for two years, with a maximum of three consecutive terms, and elections are held each year in May. Utilities are administered by Denton Municipal Utilities; the city provides water, wastewater, electric, drainage and solid waste service. The electric utility, Denton Municipal Electric (DME), has been in operation since 1905. In 2009, DME began providing 40 percent of its energy to customers through renewable resources. The City of Denton Water Utilities Department serves the city's water demand. Atmos Energy provides the city's natural gas. Denton is a part of the Sister Cities International program and maintains cultural and economic exchange programs with its sister cities, Madaba in Jordan and San Nicolás de los Garza in Mexico. The city of Denton is a voluntary member of the North Central Texas Council of Governments association, the purpose of which is to coordinate individual and collective local governments and facilitate regional solutions, eliminate unnecessary duplication, and enable joint decisions. Denton is located within U.S. House 26th Congressional district, which is represented by Michael C. Burgess. In the Texas Legislature, the city is in the 30th District in the Texas Senate, represented by Republican Craig Estes. It is in the 64th District of the Texas House of Representatives, represented by Republican Myra Crownover since 2001. Several Texas state agencies have facilities in the city, including a Texas Workforce Center, a Texas Department of Public Safety office, a Texas Department of Criminal Justice office, and a Denton District Parole Office. The Denton State Supported Living Center, formerly Denton State School, is the largest residential facility for people with developmental disabilities in Texas. The center serves an 18-county area and employs approximately 1,500 people. The Federal Emergency Management Agency (FEMA) has its Region VI headquarters in Denton. Along with much of the Dallas–Fort Worth metroplex, Denton has grown rapidly in recent years, becoming the seventh fastest-growing city[where?] with a population over 100,000 between 2010 and 2011. The city has a population of 113,383 according to the 2010 United States Census, making it the 230th largest city in the United States and the 27th largest in Texas. The population density was 1,289.1 people per square mile. There were 46,211 housing units and 39,060 households in the city. The racial makeup of the city was 73.8% White, 10.3% African American, 4.1% Asian, 0.8% Native American, 0.1% Pacific Islander, and 3.2% from two or more races. Hispanics or Latinos of any race comprised 21.2% of the population. The median income for a household was $44,415 in 2010. The per capita income was $22,940. About 20.3% of the population were below the poverty line. Denton Independent School District (DISD) provides the public primary and secondary educational system in the city. The district comprises five comprehensive high schools, one alternative high school, and primary schools. Small portions of the city extend into the Argyle and Sanger school districts. Denton is also host to several private schools with religious affiliations and alternative education models. According to the 2010 United States Census, 35.1% of all adults over the age of 25 in Denton have obtained a bachelor's degree, as compared to the state average of 25.8%, and 86.1% of residents over the age of 25 have earned a high school diploma, as compared to the state average of 80%. Denton is served by the Denton Public Library, which has three branches: Emily Fowler Central Library, North Branch Library, and South Branch Library. The University of North Texas is the second largest university in North Texas. The University of North Texas (UNT) in Denton is the flagship university of the University of North Texas System, which also includes the UNT Health Science Center in Fort Worth, the University of North Texas at Dallas, and UNT Dallas College of Law. With an enrollment of nearly 38,000, its is the sixth largest university in Texas. The university is accredited by the Southern Association of Colleges and Schools (SACS). Its College of Music, the first school to offer a degree in the field of jazz studies, is nationally recognized. Texas Woman's University (TWU) is a public university in Denton with two health science center branches in Dallas and Houston. Founded in 1901, the university enrolls more than 13,000 undergraduates and graduates. Men have been admitted to TWU since 1972 but make up less than ten percent of the university. TWU's College of Nursing is the second largest in Texas and in the top 20 of largest nursing programs in the United States, and the school's nursing doctoral program is the largest in the world. The educational services, health and social services, manufacturing, and general retail sectors employ over 20,000 people in Denton. The city's three largest educational institutions, including the University of North Texas, Denton Independent School District, and Texas Woman's University, are the largest employers, employing almost 12,000 people. The University of North Texas is the largest employer in the city, with 7,764 employees comprising 12.59% of the workforce. The City of Denton also employs more than 1,334 people. Wholesale trade and hospitality jobs also play major roles. Notable businesses headquartered in Denton include truck manufacturer Peterbilt, beauty supplier Sally Beauty Company, and jewelry producer Jostens. Golden Triangle Mall, the city's largest shopping complex with over 90 specialty shops, is a major source of retail trade. Since 1899, the Denton Record-Chronicle has been the newspaper of record for Denton. When it was acquired by Belo Corporation in 1999, the newspaper had a circulation of 16,000. The North Texas Daily and The Lasso provide daily and weekly news to students at the University of North Texas and Texas Woman's University. The city's public television station, Denton TV (DTV), covers city council meetings, restaurant scores, high school football, and educational programming. UNT's television station, ntTV, is broadcast on local channels provided by Charter Communications and Verizon Communications. ntTV News is broadcast live Monday through Thursday. KNTU 88.1 FM is UNT's official radio station. First aired in 1969, the station primarily plays a mixture of jazz and blues and covers local sports and news. I-35E and I-35W, which split in Hillsboro south of the Metroplex and come north through Dallas and Fort Worth respectively, rejoin near the University of North Texas campus in the southwest part of Denton to form Interstate 35 as it continues north on its way to Oklahoma. Loop 288 partially encircles the city; it passes through the northern limits of the city by C. H. Collins Athletic Complex and the eastern side near Golden Triangle Mall. Highway 77 and 377 go through the historic town square and Highway 380 connects Denton to Frisco and McKinney in the east and Decatur in the west. Denton Enterprise Airport is a public airport located 3 miles (4.8 km) west of the central business district (CBD) of Denton. This airport serves as home to various cargo and charter operators as well as two flight schools. A new terminal opened in 2008, but as of June 2008 no scheduled commuter service is in place. Denton is served by the Denton County Transportation Authority (DCTA), which operates local bus service and regional rail to Lewisville and Carrolton, with connections to Dallas' DART rail system. In 2011, Downtown Denton Transit Center and Medpark Station opened as commuter rail stations on DCTA's A-train, which now has five stations and connects to the Green Line of Dallas Area Rapid Transit's (DART) Green Line at Trinity Mills Station. The two transit companies, along with the Trinity Rail Express (TRE) of Fort Worth, offer regional passes to be used on any of the three systems. As of August, 2017 (no deadline announced), rides between the first two (DDTC and Medpark) and the last two (Hebron and Trinity Mills) are "fare-free," though any ride to or through the 3rd stop (Lewisville Lake) will require a paid pass. DCTA states this will relocate downtown parking needs to the underutilized space at Medpark station, and enhance mobility in Downtown Denton, including for students, as well as for residents of Hebron who connect to the DART system one stop away at Trinity Mills. DCTA also operates the Connect local bus service within the cities of Denton and Lewisville and special university shuttles. All Connect services (not the A-train) are free of charge for students at the University of North Texas who swipe their ID at the bus entrance. Special Programs for Aging Needs (SPAN), a non-profit organization, offers paratransit service for senior citizens and people with disabilities of all ages. Two major hospitals operate in Denton: Medical City Denton and Texas Health Presbyterian Hospital Denton are both full-service hospitals with differing capacities: 208 beds and 255 beds, respectively. Each employs more than 800 employees and are licensed with emergency services. In response to a 2014 city referendum prohibiting hydraulic fracturing (fracking) that passed with 59% of the vote, Texas enacted a law specifying "the exclusive jurisdiction of this state to regulate oil and gas operations in this state and the express preemption of local regulation of those operations", though it allows some "commercially reasonable" rules. Denton says it will "continue to enforce our current regulations to protect the health and safety of our residents, but we do not know how the operators or courts will react". J. Newton Rayzor - businessman and philanthropist. Dr. C. A. Bridges (1978). History of Denton, Texas From Its Beginning to 1960. Texian Press. Odom, E.D. (1996). An Illustrated History of Denton County, Texas: From Peters Colony to Metroplex. ISBN 978-0-9651324-0-4. ^ "City Council Members". City of Denton. 2016. Archived from the original on 2017-08-25. ^ "2007–08 Comprehensive Annual Financial Report". City of Denton. 2008-09-30. pp. 1–2. Archived from the original on 2010-09-19. Retrieved 2009-07-17. ^ a b "2010 Census Gazetteer Files – Places". United States Census Bureau. 2011-02-01. Archived from the original (TXT) on 2012-01-24. Retrieved 2012-06-05. ^ "Area Codes for DENTON, TX". ^ a b c d e "Denton (city), Texas". United States Census Bureau. 2012-01-31. Archived from the original on 2011-01-05. Retrieved 2012-05-16. ^ a b Odom, E. Dale. "Denton County". Handbook of Texas Online. Texas State Historical Association. Retrieved 2009-10-21. ^ Bates, Edward (1918). History and Reminiscences of Denton County. Denton, Texas: McNitzky Printing Company. LCCN 19004337. OCLC 2133818. ^ a b c d e f Odom, E. Dale. "Denton, Texas". Handbook of Texas Online. Texas State Historical Association. Retrieved 2009-10-21. ^ "Denton Record-Chronicle from Denton, Texas on July 4, 1976 · Page 42". ^ Heid, Jason (2011-01-19). "Can Denton's Fry Street Rise Again?". D Magazine. Archived from the original on 2011-07-25. Retrieved 2012-10-26. ^ "Fry Street Lot in Denton Remains Untouched by Developer". Pegasus News. 2009-09-16. Archived from the original on 2010-03-08. Retrieved 2009-10-03. ^ a b c "Texas Historic Sites Atlas". Austin: Texas Historical Commission. Retrieved April 13, 2017. ^ a b "US Newspaper Directory". Chronicling America. Washington DC: Library of Congress. Retrieved April 13, 2017. ^ a b Calendar 1985. ^ a b University of North Texas Libraries. "Denton County (TX) Newspaper Collection, 1892-1911". Finding Aids. Retrieved April 14, 2017. ^ a b Federal Writers' Project 1940. ^ a b c d e E. Dale Odom (2010-06-12). "Denton, TX". Handbook of Texas Online. Texas State Historical Association. Retrieved April 13, 2017. ^ "NCTCOG Members". Arlington: North Central Texas Council of Governments. Retrieved April 14, 2017. ^ "City of Denton, Texas, USA". Archived from the original on December 21, 1996 – via Internet Archive, Wayback Machine. ^ Kevin Hyde; Tamie Hyde (eds.). "United States of America: Texas". Official City Sites. Utah. OCLC 40169021. Archived from the original on September 25, 2000. ^ "Texas". Official Congressional Directory. Washington, D.C.: Government Printing Office. 2003. hdl:2027/mdp.39015054040954 – via HathiTrust. ^ "Denton city, Texas". QuickFacts. U.S. Census Bureau. Retrieved April 13, 2017. ^ "Denton City Council". City of Denton. Retrieved April 14, 2017. ^ "Denton History". City of Denton. Archived from the original on 2009-10-10. Retrieved 2009-09-21. ^ "About Barnett Shale". Barnett Shale Energy Education Council. Archived from the original on 2009-11-20. Retrieved 2009-11-20. ^ Airhart, Marc (2007-01-01). "Barnett Boom Ignites Hunt for Unconventional Gas Resources". Jackson School of Geosciences (University of Texas at Austin). Archived from the original on 2011-07-25. Retrieved 2009-11-20. ^ a b "Average Weather for Denton, TX – Temperature and Precipitation". The Weather Channel. Retrieved 2009-09-21. ^ "Texas Flood Report – 2001". U.S. Geological Survey. Retrieved 2009-12-01. ^ "Snowfall – Average Total In Inches". National Oceanic and Atmospheric Administration. 2008-08-20. Archived from the original on 2011-06-19. Retrieved 2009-12-01. ^ Cobb, Dawn (2012-06-20). "'Breakout Year' for Denton Airshow". Denton Record-Chronicle. Retrieved 2012-06-22. ^ "KDB – Denton Redbud Festival". Keep Denton Beautiful. Retrieved 2009-10-03. ^ "Official Capital Designations – Texas State Library". Texas State Library and Archives. Retrieved 2007-07-09. ^ Lewis, Bj (2009-09-14). "Fiesta on the Square built out of partnerships". Denton Record-Chronicle. Archived from the original on 2011-09-28. Retrieved 2009-10-03. ^ "About Thin Line". Thin Line Film Fest. Archived from the original on 2009-08-22. Retrieved 2009-09-24. ^ Wylie, Melissa (April 4, 2014). "Largest community garden in U.S. feeds the hungry in Denton". The Dallas Morning News. James M. Moroney III. Retrieved 2 August 2015. ^ a b "University of North Texas College of Music". Handbook of Texas Online. Retrieved 2009-10-19. ^ Sims, Dave (2008-11-21). "Signs of Life 2008: Best Music Scene – Denton, Texas". Paste. ^ Freedman, Pete (2008-05-09). "Dallas Music – Denton Music Deserves Our Attention". Dallas Observer. Retrieved 2009-10-02. ^ Beehner, Lionel (2008-05-11). "An Indie Scene That Comes With a Texas Twang in Denton". New York Times. Retrieved 2009-01-22. ^ Lionel Beehner. "Signs of Life 2008: Best Music Scene – Denton, Texas". New York Times. Retrieved 2009-01-22. ^ "Denton Arts & Jazz Festival". City of Denton. Retrieved 2009-09-18. ^ "Denton Jazz Festival – The Festival Beat" (PDF). Denton Festival, Inc. 2009-01-01. Archived from the original (PDF) on 2011-07-09. Retrieved 2009-10-30. ^ Breeding, Lucinda (2010-01-30). "Prestige builds for NX35". Denton Record-Chronicle. Archived from the original on 2012-01-12. Retrieved 2010-02-11. ^ "The Road to 35: The Meaning and Reasons Behind A Festival's Various Name-Changes | FrontRow". Frontrow.dmagazine.com. 2011-07-20. Retrieved 2012-08-13. ^ Rao, Mallika (2014-03-18). "Forget SXSW, Here Are 8 Emerging Cultural Hot Spots You Need To Visit In Texas". Huffington Post. ^ "National Register of Historical Places – TEXAS (TX), Denton County". National Register of Historical Places. 2001-01-05. Retrieved 2009-11-02. ^ "Denton Economic Development". Denton Economic Development Partnership. Archived from the original on 2009-02-23. Retrieved 2009-10-03. ^ Breeding, Lucinda (2011-11-22). "No Combo". Denton Record-Chronicle. Retrieved 2012-10-26. ^ "Confederate Soldiers' Monument". Portal to Texas History. University of North Texas. February 20, 2008. Retrieved August 14, 2016. ^ "Denton Confederate Soldier Monument Draws Debate". KXAS-TV (NBC TV Dallas-Fort Worth). June 24, 2015. Retrieved August 14, 2016. ^ "City Council Members". City of Denton. Archived from the original on 2009-10-11. Retrieved 2009-09-21. ^ "City of Denton, TX: Denton Municipal Electric". City of Denton. Archived from the original on 2009-10-10. Retrieved 2009-10-02. ^ "Sister Cities International (Online Directory: Texas, USA)". Sister Cities International. Archived from the original on 2008-02-10. Retrieved 2007-04-09. ^ "The Texas State Senate – Senate Members Complete List". Texas Senate. Archived from the original on 2009-07-05. Retrieved 2009-09-21. ^ "Texas Legislature Online – Information for Rep. Myra Crownover". Texas Legislature Online. Retrieved 2012-06-06. ^ "Texas Workforce Center Tax Offices". Texas Workforce Center. Retrieved 2009-10-30. ^ "Denton County, Texas – Department of Public Safety". Denton County. Retrieved 2009-10-30. ^ "FEMA: Region IV". Federal Emergency Management Agency (FEMA). Retrieved 2009-10-30. ^ "Population". dentonedp.com. Denton, Texas: Denton Economic Development Partnership. 2012. State and Federal Estimates. Archived from the original on 2007-07-01. Retrieved 2012-10-09. ^ "About Our District". Denton Independent School District. Retrieved 2012-11-23. ^ "City of Denton, TX: History of Denton Public Library". City of Denton. Archived from the original on 2011-06-09. Retrieved 2009-11-25. ^ "Perry Signs UNT Law School Bill". Dallas Business Journal. American City Business Journals. 2009-06-22. Archived from the original on 2009-06-26. Retrieved 2009-10-14. ^ "UNT's enrollment hits new all-time high". 2017-10-04. ^ "Commission on Colleges". Commission on Colleges of the Southern Association of Colleges and Schools. Archived from the original on 2009-09-18. Retrieved 2009-09-23. ^ "TWU – Brief History of TWU". Texas Woman's University. Archived from the original on 2009-02-21. Retrieved 2009-09-23. ^ "Patricia Holden-Huchton named dean of TWU's College of Nursing". Texas Woman's University. Archived from the original on 2008-07-23. Retrieved 2009-09-23. ^ "Texas Board of Nursing" (PDF). ^ Langley, Bryan (2012-12-10). City of Denton, Texas Comprehensive Annual Financial Report for the Fiscal Year Year Ending September 30, 2011 (Report). City of Denton. p. 115. Archived from the original on May 10, 2012. Retrieved 2012-10-09. ^ "Denton Economic Development". Denton Economic Development. Archived from the original on 2009-11-11. Retrieved 2009-10-18. ^ "Golden Triangle Mall – About Us". Golden Triangle Mall. Archived from the original on 2009-04-30. Retrieved 2009-09-21. ^ City of Denton, Texas Comprehensive Annual Financial Report for the Fiscal Year ended September 30, 2017 (PDF) (Audited Report). City of Denton, Texas. March 2, 2018. Retrieved March 1, 2019. ^ "Belo Acquires Denton Publishing Company" (Press release). PRNewswire. 1999-06-17. Retrieved 2009-09-24. ^ "DTV – Schedule". City of Denton. Archived from the original on 2012-12-19. Retrieved 2012-12-14. ^ "About News Department". NorthTexasTelevision.com. ntTV. Retrieved 2012-12-14. ^ "KNTU". KNTU. Retrieved 2009-09-24. ^ Brown, Lowell. "Senator: New airport terminal to help city grow". Denton Record-Chronicle. Archived from the original on 2011-07-17. Retrieved 2009-09-18. ^ Peterson, Matt (2011-06-20). "A-train Railway Begins Rolling, Carrying Commuters from Denton to Carrollton". The Dallas Morning News. Retrieved 2011-06-20. ^ /humans.txt. "News & Events | Denton County Transportation Authority". www.dcta.net. Retrieved 2017-10-16. ^ "Resources - Transportation | Division of Student Affairs". studentaffairs.unt.edu. Retrieved 2017-10-16. ^ "SPAN, Inc". Special Programs for Aging Needs. Archived from the original on 2009-09-19. Retrieved 2009-09-23. ^ "About Texas Health Presbyterian Hospital Denton". Texas Health. Retrieved 2009-09-24. ^ "Best of Denton: Business at their best". Denton Record-Chronicle. 2009-04-29. Archived from the original on 2010-03-26. Retrieved 2009-10-14. ^ Krauss, Clifford (November 5, 2014). "Split Decision by Voters on Local Fracking Bans". The New York Times. ^ "HB 40". Texas Legislature Online. ^ Malewitz, Jim (May 18, 2015). "Abbott Signs "Denton Fracking Bill"". Texas Tribune. ^ Graeber, Daniel J. (May 20, 2015). "Texas city will still enforce fracking regulations". UPI. ^ "Game Time for Parquet Courts". 2014-07-08. "Denton". Texas State Gazetteer and Business Directory. St. Louis: R.L. Polk & Co. 1884. Ed F. Bates (1918). History and Reminiscences of Denton County. Denton: Denton, Tex., McNitzky printing company. Mary Jo Cowling. Geography of Denton County. Dallas: Banks Upshaw and Co., 1936. E. Dale Odom and Bullitt Lowry. A Brief History of Denton County, Texas. Denton: Denton County Historical Commission, 1975. 1986 Calendar of Early Denton History. Friends of the Denton Public Library. 1985 – via University of North Texas Libraries. 1988 Historical Calendar: Mayors of Denton. Friends of the Denton Public Library. 1987 – via University of North Texas Libraries. Hollace Hervey (2002). Historic Denton County: An Illustrated History. San Antonio: Historical Publishing Network. ISBN 978-1-893619-07-4. Paul T. Hellmann (2006). "Texas: Denton". Historical Gazetteer of the United States. Taylor & Francis. ISBN 978-1-135-94859-7. Wikimedia Commons has media related to Denton, Texas. "United States - Texas - Denton County - Denton". Portal to Texas History. Denton: University of North Texas Libraries.